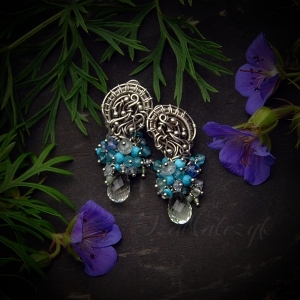 Moderate in size but juicy in colour and rich in texture earrings made entirely by hand in oxidised and polished fine and sterling silver, adorned with cascades of vibrant blue-green shaded gemstones like prasiolite, turquoise, topaz, kyanite, aquamarine and peridot. The earrings are 4,5cm long and 2cm wide. One earring weighs about 6 grams. The earpost is located at the very top of the earring.